MUSIC NEWS - The All-American Rejects’ lead singer Tyson Ritter and Valiant Watches have launched a partnership campaign to support of Ritter’s charity Don’t Hate on Haiti, along with a touching video about the campaign. Twenty-five percent of proceeds from sales of Valiant’s featured BE.REAL Watch, as well as from sales using promotional code DHOH, will be donated to the organization, which is dedicated to bringing clean and safe drinking water to remote communities in Haiti. “I’m so fortunate to have Valiant Watches partner with me to keep up awareness for those doing without in Haiti,” said Ritter, who confirms that 100% of donated funds go directly to building clean water projects for the people of Haiti. Every $5,000 raised translates into a clean water well built in Haiti. In addition to supporting DHOH, Valiant customers who purchase the featured watch or use the promo code will be entered for a chance to win a guitar signed by The All-American Rejects. JOHNNY CASH Auction Announced in L.A.
MUSIC NEWS- Beverly Hills, CA auction house, Julien's Auctions has announced an auction of property from the life and career of Johnny Cash. The auction will include items from Cash's military career, his life and partnership with June Carter Cash, into his time as a part of the Highwaymen with his friends through the end of his career. A portion (tbd) of the sale proceeds will benefit MusiCares. Highlighted in the upcoming sale are lyrics personally writen by Cash. Lyrics include Cash's take on traditional songs, an alternate version of "Don't Take Your Guns To Town," (Est. $2,000/4,000) and many songs that he never got to record. Also in the lot are three guitars from different periods in Cash's career; a vintage 1951 Martin guitar used by Cash in studio that later became the designated tour bus guitar (Est. $20,000/ 30,000). 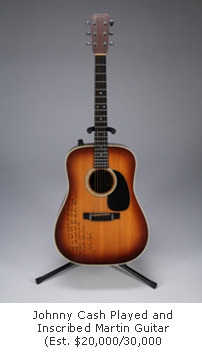 Second guitar is a Grammer Johnny Cash model used extensively by Cash on The Johnny Cash Show and later inscribed by Cash, "To Richard,/ Play It Pretty/Johnny Cash" ($30,000/40,000). Third up is a guitar, also a Martin , used by Cash in the 1980s and gifted to his friend Bill Miller, featured on the cover of his live album The Survivors. It was inscribed by Cash with the first four lines of "I Walk the Line." (Est. $20,000/30,000). MUSIC NEWS - A limited edition MINI Cooper that's been personalized by English rocker, Paul Weller (Style Council / The Jam) is being auctioned off for two charity organizations. Weller (out with his recent Wake Up the Nation album) designed the car based on a shirt he designed for English fashion label Ben Sherman and features brown and pink stripes along the length of the British car. In addition to Weller's exterior design, the car has $6500.00 of extras including alloy wheels and bi-xenon headlights, bringing the total value of the car up to $29,000.00. Proceeds from the car's sale will go to Nordoff Robbins, a charity that helps people with disabilities revitalixe their life through music, and War Child, a charity that helps children whose homes have been ravaged by war. So far, the auction has 23 bids, but don't wait too long as you only have to December 11, 2010 ! MUSIC NEWS - Jimmy Buffett and some of his friends will be appearing at a Gulf Coast benefit concert on July 1. The special Gulf Shores, AL beach concert will aid Gulf Coast residents affected by the April Gulf of Mexico oil spill will feature Buffett and the Coral Reefer Band, Zac Brown Band, Kenny Chesney, Jesse Winchester, Sonny Landreth and Allen Toussaint. The show will air live on the CMT network from 8-9:30pm EDT. It's a free show, but the idea is to raise money, so pick up one of the t-shirt specially designed for the event. It'll be sold online as well as at the event siteshow and you can expect other opportunities to help. Additional details (more acts?) will be announced soon. More info Buffett’s website, here . MUSIC NEWS - Life is good® and promoter Superfly Presents today announced the lineup for the 2010 Life is good Festival at Blue Hills. See previous MNN Life is good fest news. Set to take place September 11 & 12 at Prowse Farm in Canton, MA, a suburb of Boston, the multi-faceted event combines world-class headliners, popular developing bands and several of the top children's artists working today. With a wide range of entertainment options including games, interactive art activities and a nationally-known circus company, this one-of-a-kind festival aims to raise $1 million for kids facing life-threatening challenges through the Life is good Kids Foundation. MUSIC NEWS - One of rock’s (and our) most beloved and enduring bands, Goo Goo Dolls, have announced plans to release their ninth studio album, SOMETHING FOR THE REST OF US, on August 31, 2010 (via Warner Bros Records). The new album is the follow up to their 2006 release, Let Love In, which marked the Goo Goo Dolls’ 20th anniversary as a band. The new set will feature the band’s new single, “Home”, which is getting solid radio airplay. You'll be able buy your digital copy of Home starting on June 8th. "Well, Oasis is no longer," he said. "I think we all know that. So that's done." As for his venture into the fashion biz, Liam said he "loves" clothes and always went on shopping trips while on the road. He said he still plans to make music, but he's certain Oasis had come to an end after an 18 year run. "Without a doubt," he said. "And it's a shame but that's life. We had a good run at it. The thing about Oasis is, no one ... we ended Oasis. No one ended it for us. Which was pretty, kind of... cool. I'm thinking of what the next step is musically, which is all my mind's on." He added: "I'll be doing music to the day I die. People will be able to buy his [Noel's] records. People will be able to buy our records. So everyone's happy." Will You Wear Scott Weiland's Pants ???? MUSIC NEWS - Scott Weiland, the noted lead singer of Stone Temple Pilots,Vevet Revolver and currently on tour promoting his solo release, Happy in Galoshes (Softdrive Records), along with Christopher Wicks, designer and owner of Rock & Roll Religion, today announced the launch of their contemporary men's collection --Weiland for English Laundry. The collection will debut at Magic Las Vegas (fashion trade show) on February 17, 2009. Mr Wicks, designer and owner of English Laundry, Fender: The Clothing Collection, and The Jimi Hendrix Experience, has teamed with Scott Weiland to create a collection that embodies the iconic style of the fashionable STP front man. "From early on, I was inspired by rock icons like David Bowie and Keith Richards who helped in molding my personal sense of style," said Weiland. "I am really looking forward to launching this line with Christopher Wicks and English Laundry." "I have the utmost respect for Scott Weiland, both as an artist and as a designer," said Wicks. "He is truly one of the last great rock stars, and his impact on style and music is undeniable. I am proud to be joining forces with him for this collaboration."